Forward Thinkers, the bible says life will be filled with trouble but the Lord also promises us He is a Healer. The Lord was not a Healer the Lord is a Healer and no matter the hurt we experience from broken bones to broken hearts God is still able to heal us if we desire to be healed. Yes, you must decide to receive your healing and remember you will be healed according to your faith. Forward Thinkers, Spiritual Healing is a huge need in the Body of Christ. According to the World Christian Encyclopedia, approximately 16 million believers walk out of the Christian church each year and most never return. Spiritual burn out due to misplaced faith and carnal spiritual leadership is at an all time high. In North America, an average of 1,500 Pastors and Ministry Leaders leave their post each month, again, most never return to their assignment. Forward Thinkers, the church has tried to excite hurting people with gimmicks and false promises causing the wounded to leave church bitter instead of healed. We must go back to loving on people unconditionally if our desire is to see this nation healed. 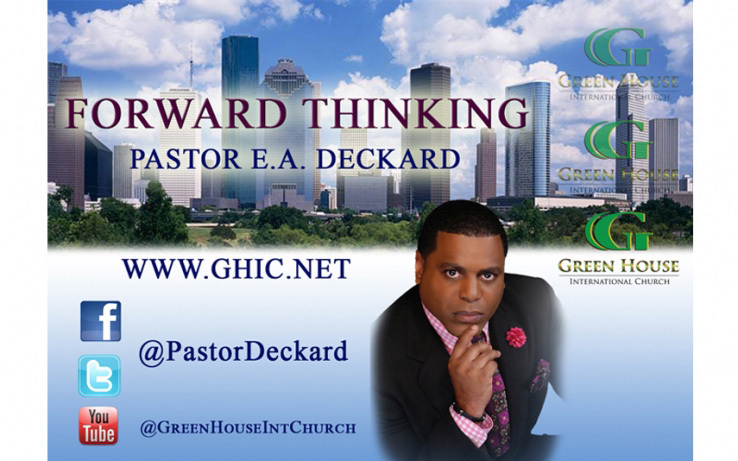 Forward Thinkers, matter of fact, the Green House International Church was birthed on August 12, 2007 (11 years ago next month) to be a place of recovery for hurting people. Unfortunately, when we think of recovery our minds go straight to drugs and alcohol but the reality is there are 100’s of life issues other than drugs and alcohol that have left people hurting and wounded. My wife and I had to recovery from grief after losing a baby and last year this church helped over 18 thousand people recover from Hurricane Harvey when others left them behind with false hope. 5 But to Hannah he gave a double portion, because he loved her, though the Lord had closed her womb. [a] 6 And her rival used to provoke her grievously to irritate her, because the Lord had closed her womb. 7 So it went on year by year. As often as she went up to the house of the Lord, she used to provoke her. Therefore Hannah wept and would not eat. 8 And Elkanah, her husband, said to her, “Hannah, why do you weep? And why do you not eat? And why is your heart sad? Forward Thinkers, Hannah is married to a God fearing, praying church going man but as he serves others in the church Hannah is being hurt by those in the church. Her issue was personal and difficulty but the church people (Women) found out and used it to hurt her instead of loving on her and embracing her they put her down, talked about her on Face book, turned prayer time into gossiping about Hannah time. The bible says Hannah cried every service and these were not tears of joy but tears of rejection and sadness. The church lied and said come as you are when they really meant you better come as we are. My pray is no matter how you enter through those front sliding doors at the Green House International Church you will leave out better not bitter. Forward Thinkers, I’ll go to war against those in church mistreating the least of them. How do you focus on God the Healer when the abuser, the liar, the gossiper, the false Prophet, and the devils handymen are sitting in the House of God with you? Forward Thinkers, I’m leave you hanging right here for a minute and move to Family Hurt because at the end of the day we will discover the answer to all hurt is the same. 18 They saw him from afar, and before he came near to them they conspired against him to kill him. 19 They said to one another, “Here comes this dreamer. 20 Come now, let us kill him and throw him into one of the pits. Joseph had a dream to be somebody special, somebody God was going to greatly bless, somebody that would be in charge, somebody with great influence and power. His brothers hated him because of his dream to be somebody. They plotted to kill him. Anybody here still standing in the FOG (Favor of God) in spite of others plotting against you? Forward Thinkers, in life we expect to be let down or mishandled by outsiders but when it comes from the inside it hurts more but the hurt can’t remove the FOG Favor of God from your life. I’ve discovered God does some of His best work while I’m dealing with something bigger than me God is setting up my next chapter in life. Miracles and breakthroughs are being preformed behind the curtains. His brothers sold him to the Midianites who then sold him to Potiphar but none of that stopped the favor of God from being with Joseph. Forward Thinkers, I know it’s hard sometimes but today I need you to recognize the FOG Favor of God through it all and never forget God is a Healer. Yes, whatever you’re going through right now remember this is not how the story ends God is going to heal you and elevate you. 10 Create in me a clean heart, O God, and renew a right[a] spirit within me. Forward Thinkers, at a young age David experienced great success he defeated Goliath the giant and became King of all Israel. David become one of the most powerful men in history but he messed up real bad when he committed adultery with Bathsheba and had her husband killed at war. Forward Thinkers, David’s choices brought negative consequences and he is now experiencing Self Hurt. The Lord opened up Hannah’s wound and blessed her with a son that would become a great Man of God in front of all those that hurt her in the church. David realizes his story can be used to teach others that the Great Physician can completely heal our broken heart and bind up our wounds, healing us and making us whole again. The Lord showed Joseph favor and he went from being the hated Dreamer to being the Savior of his family. God used him to save the same brothers who plotted to kill him. Remember what the devil meant for bad God will turn around for good. David messed up big time but God’s grace and mercy held him up and restored him. Today the life story of David is blessing many and if you seek God’s divine healing your testimony will encourage many. Forward Thinkers, no matter what God is still a Healer and it’s time to be healed from church hurt, family hurt, self hurt and any other hurt you may be experiencing. It’s no longer on them it’s now on you to decide I AM HEALED-I AM SET FREE!! !